MedaMorph was developed in collaboration with Alberto Meda, whose engineering background is evident in the form and function of this prestigious conference table system. Melamine-coated table tops Description: the plastic-coated flat press board (MCB = melamine-coated board) is a fine particle board (P2) coated with melamine resin compliant with DIN EN 14322. Surface: the reflection values, sheen and brightness do not exceed the thresholds recommended for standard work stations. Edge: the table top has 3-mm-thick ABS lipping. 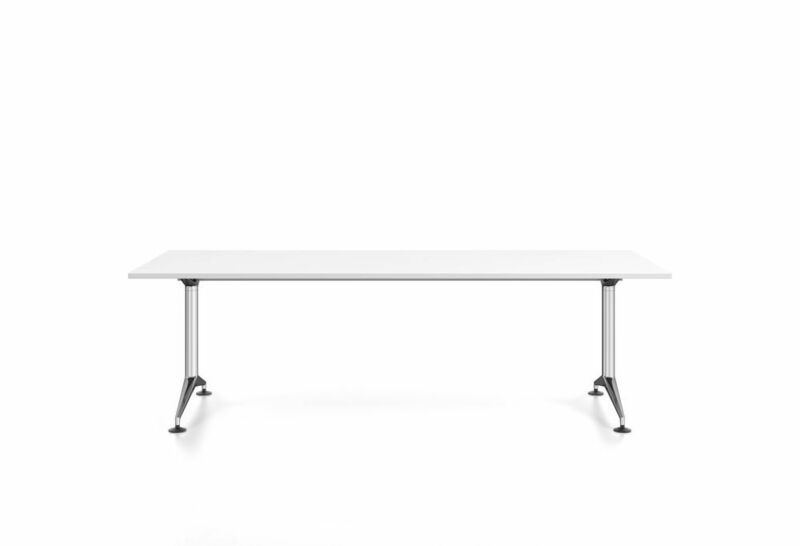 T-section leg for rectangular table Description: the tabletop supports and feet (with 2 black plastic glides, adjustable by up to 10 mm) are made of polished die-cast aluminium, the central column of chrome-plated steel. In the case of rectangular tables, the T-section leg is attached in combination with a central strut. The strut is screwed to the tabletop and placed in the centre of the tabletop support. Attachment: each leg is attached to the tabletop by 2 milled screws (no tools required). Depending on the size of the table, the slot-in legs can be positioned in 2 or 3 different places to set them back from the edge of the tabletop as required. System base Description: the system base is a modular kit that allows conference tables to be constructed in all shapes and sizes. In the MedaMorph collection, the system bases for the conference tables are round and boat-shaped. The system base consists of four components: Star connector: powder-coated die-cast aluminium in silver with 16 anchoring points for struts. System/T-section leg (conference systems): the feet (with 2 black plastic glides, adjustable by up to 10 mm) are made of ball-polished die-cast aluminium, the central column of chrome-plated steel. Always used/supplied with a star connector. Struts: the steel struts (powder-coated silver) are supplied in various lengths depending on the size of the table and serve as cable guides. The struts link the star connectors and consequently the legs. Struts are available in all lengths from 180 to 2,500 mm.